For Counseling Internship and Counseling Practicum courses. Expectations and how to get the most out of the supervision process. Assessing and intervening with clients in danger and crisis. Wellness and developing healthy work and personal habits to carry through one’s entire career. Apply the laws and ethics in everyday clinical practice. Work with special issues (neuropsych and psychopharmacology) and populations. Market and position oneself in the job market, with an eye toward growing/marketing a counseling practice after graduation. This title is also available with MyCounselingLab—an online homework, tutorial, and assessment program designed to work with the text to engage students and improve results. Within its structured environment, students see key concepts demonstrated through video clips, practice what they learn, test their understanding, and receive feedback to guide their learning and ensure they master key learning outcomes. Several self-assessment activities in each chapter encourage self-reflection and self-assessment on the concepts of the chapter. Realistic case examples embedded in each chapter challenge readers to apply knowledge and skills to realistic cases they are likely to encounter in the field. Cutting edge practice advice on neuropsychology and psychopharmacology keep students up to date on the changing elements of the counseling practice (Chs. 4 and 11). A full chapter on marketing shows students can position themselves in the job market and then grow and market the counseling practice after graduation (Ch. 13). Help for learning to develop counselor self-care and establishing the importance of wellness habits during training, as a start to keeping healthy throughout an entire career is included in Chapter 12. Readers learn the finer aspects of relationship building, goal setting, record keeping, and integration of theory into practice in separate, dedicated chapters. This title is also available with MyCounselingLab–an online homework, tutorial, and assessment program designed to work with the text to engage students and improve results. Within its structured environment, students see key concepts demonstrated through video clips, practice what they learn, test their understanding, and receive feedback to guide their learning and ensure they master key learning outcomes. Learning Outcomes and Standards measure student results. MyCounselingLab organizes all assignments around essential learning outcomes and national standards for counselors. Video- and Case-Based Assignments develop decision-making skills. Video- and Case-based Assignments introduce students to a broader range of clients, and therefore a broader range of presenting problems, than they will encounter in their own pre-professional clinical experiences. Students watch videos of actual client-therapist sessions or high-quality role-play scenarios featuring expert counselors. They are then guided in their analysis of the videos through a series of short-answer questions.These exercises help students develop the techniques and decision-making skills they need to be effective counselors before they are in a critical situation with a real client. Licensure Quizzes help students prepare for certification. Automatically graded, multiple-choice Licensure Quizzes help students prepare for their certification examinations, master foundational course content, and improve their performance in the course. Video Library offers a wealth of observation opportunities. The Video Library provides more than 400 video clips of actual client-therapist sessions and high-quality role plays in a database organized by topic and searchable by keyword. The Video Library includes every video clip from the MyCounselingLab courses plus additional videos from Pearson’s extensive library of footage. Instructors can create additional assignments around the videos or use them for in-class activities. Students can expand their observation experiences to include other course areas and increase the amount of time they spend watching expert counselors in action. The online gradebook automatically tracks your students' results on tests, homework, and practice exercises and gives you control over managing results and calculating grades. The gradebook provides a number of flexible grading options, including exporting grades to a spreadsheet program such as Microsoft Excel. And, it lets you measure and document your students' learning outcomes. 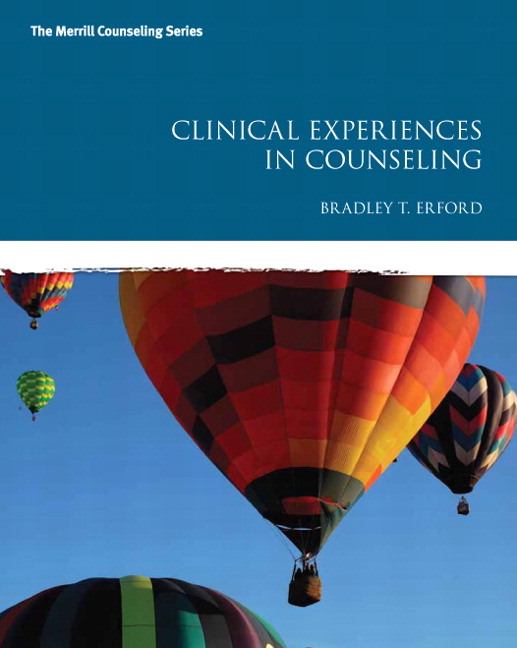 Bradley T. Erford, Ph.D., LCPC, NCC, LPC, LP, LSP, is the 2012-2013 President of the American Counseling Association (ACA) and a professor in the school counseling program of the Education Specialties Department in the School of Education at Loyola University Maryland. He has authored or edited more than 24 books. His research specialization falls primarily in development and technical analysis of psycho-educational tests and outcomes research and has resulted in the publication of more than 60 refereed journal articles, more than 100 book chapters, and 15 published tests. He has received numerous awards for his scholarship and service to the counseling profession from ACA and the Association for Assessment and Research in Counseling (AARC), organizations within which he has held numerous leadership positions.